It's Monday again and that means it's time for another piCture pOlish lovely. PP make awesome glitters, HOLOS and metallic polishes, but they also do some genuinely lovely cremes, which often get overlooked. So today we have one of the cremes and it IS creamy and dreamy and greeny! Despite being called Tiffany, this is NOT (well, to my eyes anyway) the aqua shade I expected, but instead it's a delicious soft mint green. It's also ridiculously glossy - can you see that shine? I used 1 coat of Poshe over my mani, and the combination looked really high-end salon. 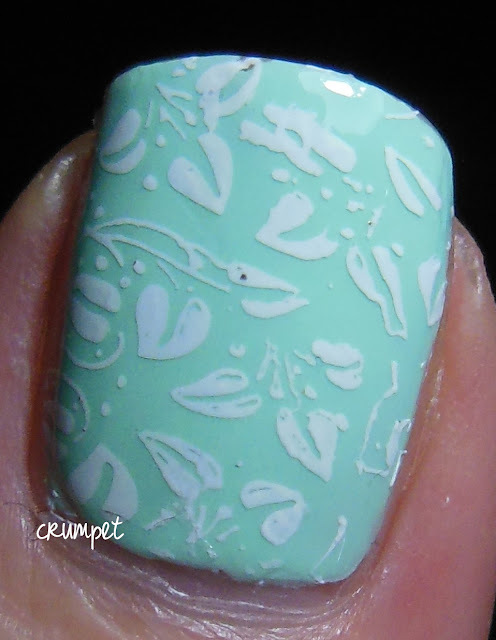 I then did some stamping with DRK-C. I wanted a soft leafy design, but the execution wasn't quite as perfect as I wanted. I think the engravings on the plate were a tad shallow, because I couldn't get a good image (like the thumb) unless the plate was sparkly clean. 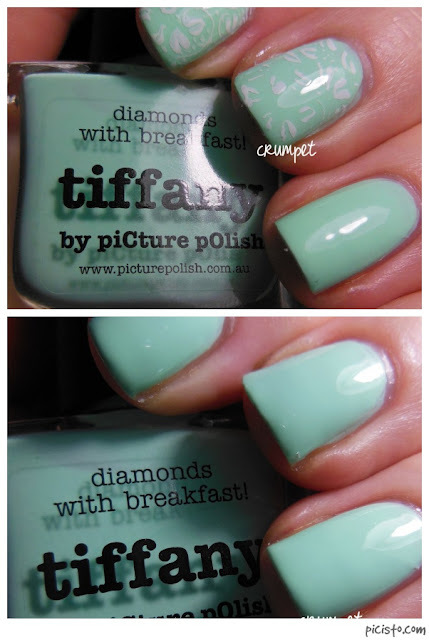 Tiffany is perfect for summer and spring - it's a clean, fresh shade that just works. Lovely. Don't forget to go and see what Claudia is up to, she's got Cosmos today.